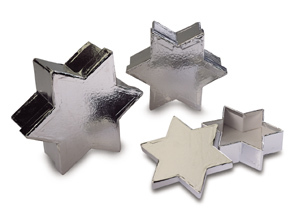 Set of 3 silver Star of David boxes makes a dramatic gift presentation. Small: 5" diameter with 1" depth. Medium 6" diameter with 2" depth. Large 7" diameter with 2.5" depth. Price is per set of 3 boxes. 11 sets available.